Dashing iconic pith helmet with breather holes, adjustable leather headband, and a vintage Palm Beach label, apparently never worn. 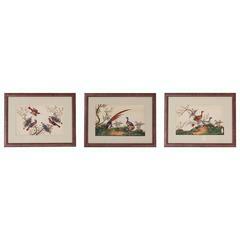 Charming framed and matted antique Chinese painting of birds. Painted on pith paper with gouache in bold colors in a scholastic style. 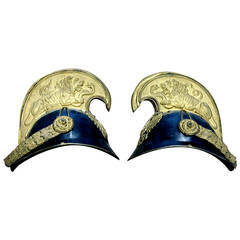 Having the expected wear and foxing. Sailors valentine composed in precise geometric patterns using an impressive array of petite seashell specimens with a centre mirror. Presented in an octagon shaped shadow box. 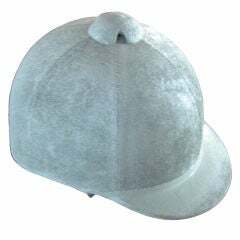 Cream colored child's riding helmet. We think it was painted this color over the velvet. Still has brown ribbon in back. Definitely would make a unique decorative object. 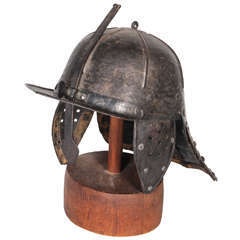 Handsome 19th century Austrian helmet. 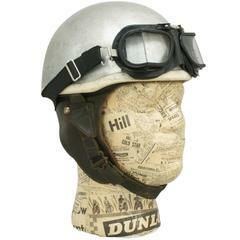 Helmet has been separated into two parts so they can be flush mounted to a wall.